The California Science Center is one of the West's best science museums, especially for curious children whose parents help them learn. It's roomy, offers a wide variety of exhibits on timely topics and provides some interesting insights into things scientific. Unlike similar institutions in other locations, the California Science Center has enough hands-on exhibits to go around, and even on a busy day, you don't have to wait long to try any of them. They also rely more on exciting ideas and demonstrations, than gee-whiz gadgets or computer-aided graphics, and have an exceptional life sciences section. And the most exciting thing? 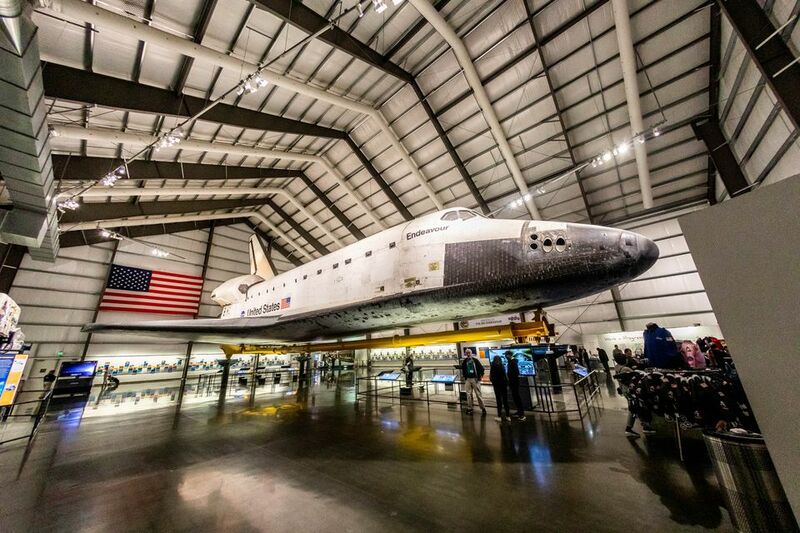 When Space Shuttle Endeavour made its final journey, it went to the California Science Center and is on display in the Samuel Oschin Pavilion. The must-see shuttle is accompanied by the Endeavour Together: Parts & People exhibit, featuring artifacts from Endeavour, and the external fuel tank. If you visit the California Science Center with children under 7, the Discovery Rooms in Creative World have exhibits specially geared toward younger children. Younger visitors seem to especially get a kick out of the hands-on Slime Bar, where kids can make their very own batch of the slippery, squishy stuff. They also have a number of Science Spectacular Shows and demonstrations where science is the star, and the audience is entertained. The Kelp Forrest Dive Show teaches audiences about the 18,000-gallon kelp forest tank while talking to a real diver inside the tank. Check with the information desk when you arrive to get a daily schedule. The California Science Center also has one of the best technical museum book and gift shops around. Besides the standard science-based games, geeky t-shirts and souvenirs, they stock an excellent selection of books for all ages. You can grab a bite to eat at Trimana - Grill, Market and Coffee Bar, serving up hot and cold meals, light snacks and desserts. If you're only visiting the exhibits and not seeing an IMAX film or a special exhibit, you don't need to stop at the ticket booths. Just walk on in. Admission is free, but you can make a donation to the California Science Center inside if you want. The exhibits start before you get inside, so don't just hustle through the entry plaza - stop to take a look around as you go. Allow 3 to 4 hours after you get inside - longer if you're geeky curious or if you want to see an IMAX film or a special California Science Center exhibit. You can take pictures of the Space Shuttle for personal use, but leave food, drink and large bags outside. They aren't allowed. The best time to visit is weekday afternoons. Traffic in the area gets crowded when there's a football game at nearby USC. Check their website for traffic advisories. The Lucas Museum of Narrative Art (commonly called the George Lucas Museu) will also be nearby when it is completed. You can get current construction status on their website. Admission is free to permanent galleries, but there is a ticket charge for IMAX films or special exhibitions. You will need reservations for Space Shuttle Endeavour on weekends and holidays, which requires a small processing fee. Reserve tickets in advance on their website. There is always a parking fee. Where is the California Science Center Located? Given the scarcity of street parking in the area, it's best to pay to park at the California Science Center lot. Instead of worrying about traffic and parking, try leaving your car at home and ride the Metro Expo Line, getting off at the Expo/Park station. Check the Metro Expo Line schedule here. The California Science Center is located 0.2 miles from the station, on the south side of the Rose Garden.